So I always try and give back as much as possible. I believe the success I have on social media networks should be used for a greater good. I have been working with a charity called The Big Match, who raise money for awareness of brain tumours. I am good friends with the people who started The Big Match so it is a charity close to my heart. 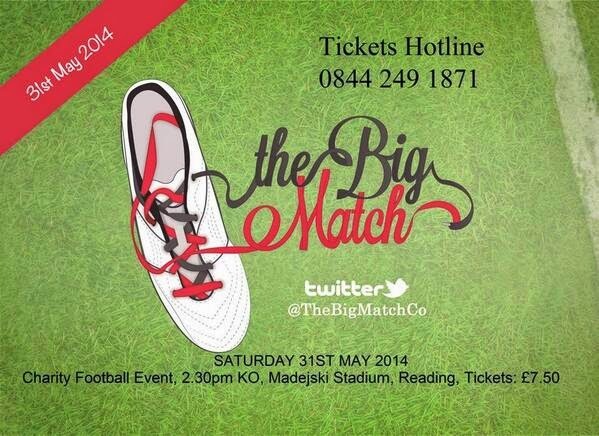 The Big Match is a charity football event that raises money for Action 4 Children & The Brain Tumour Charity. Celebrities, ex footballers and members of the public will be lacing up their boots on the 31st May, at Madejski Stadium, Reading, to play against each other. Come down and see the likes of Suzanne Shaw, Sam Attwater, Michelle Heaton & Danyl Johnson at this family fun day! It would be amazing for some of you to come down to the event and support the cause. I will be there all day too so it would be lovely to meet some of you.